The whip birds cast into song and I knew it was spring. Green shoots were covering our dwarf apples, still in their pots waiting for a new home in the earth. We had been pondering our garden plans for a few months. Plan number four won our hearts (and heads, surely a winning combination), see The Plan: Designing a Garden. In an effort to beat the heat of summer we have been hoeing, barrowing and digging for the past month. This past October long weekend we had a garden working bee with my parents and Star the border collie (chicken guard and horse rounder upper, a sure sign of a dog in need of a flock of wooly sheep). I was reminded that all that is required to keep my Dad happy is to hand him a shovel and let him dig. There's therapy in the earth. However I must remember to make him a pair of leather arm guards for Christmas, as whenever he helps at our place he seems to do battle with sharp objects (rusty corrugated iron and this time it was a rose bush). Unfortunately the blood on his arms suggests he came out second best. But he stilled called to thank me for the weekend. Thanks Mum and Dad and of course to Cam. 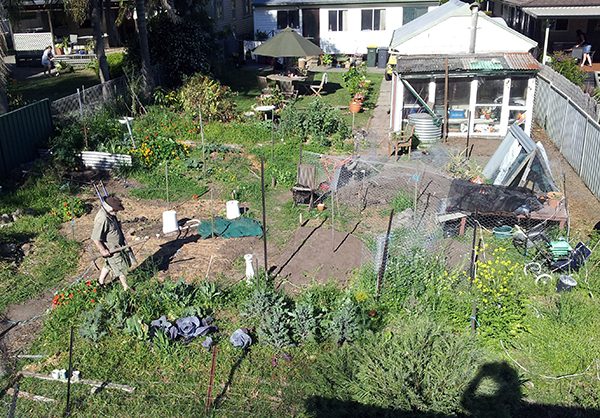 The view from the stable roof, overlooking the beginnings of the mandala garden (left) and the last crop in the original vegie beds (front). Dad with a shovel in his hand. 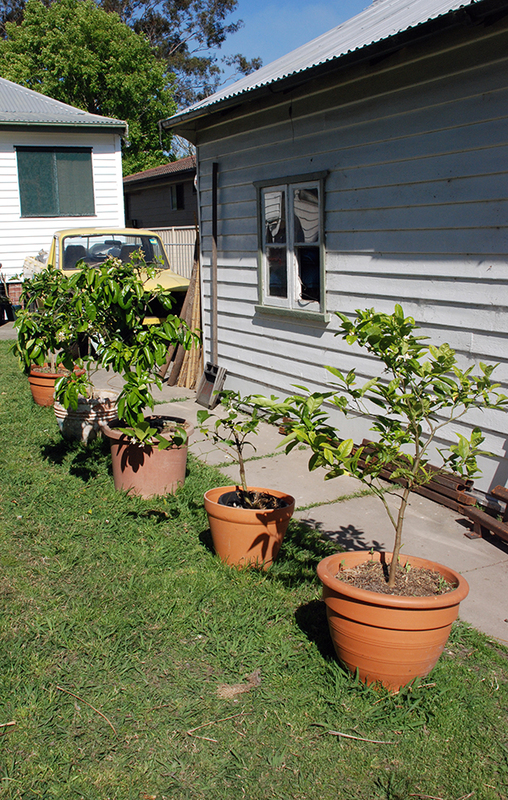 The citrus avenue softens the hard lines of path and garage, all gifts from family.